Welcome to Day 27 of the 31 Days 31 Printables series. If you are just joining us, I’m ending the month by updating and refreshing some of my personal planner printables. 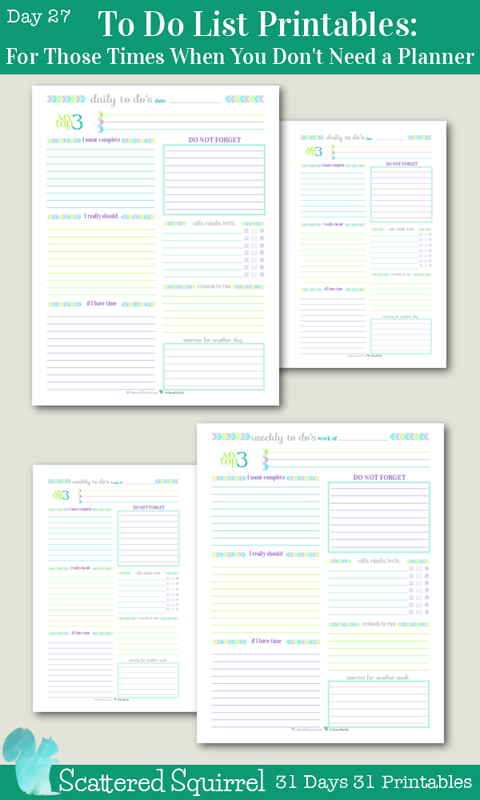 These are the printables that I currently use, or have used in the past, to help me stay on track when it comes to managing my and my family’s schedules. If you’ve been reading my little ole blog for a while, then you know I absolutely LOVE planners. I think I may even be bordering on obsessive or addicted to planners. But there are days, even weeks when sometimes I just don’t need a planner. I don’t need to know when I’m doing something, I just need to know that it is something I have to do at some point that day, week or month. 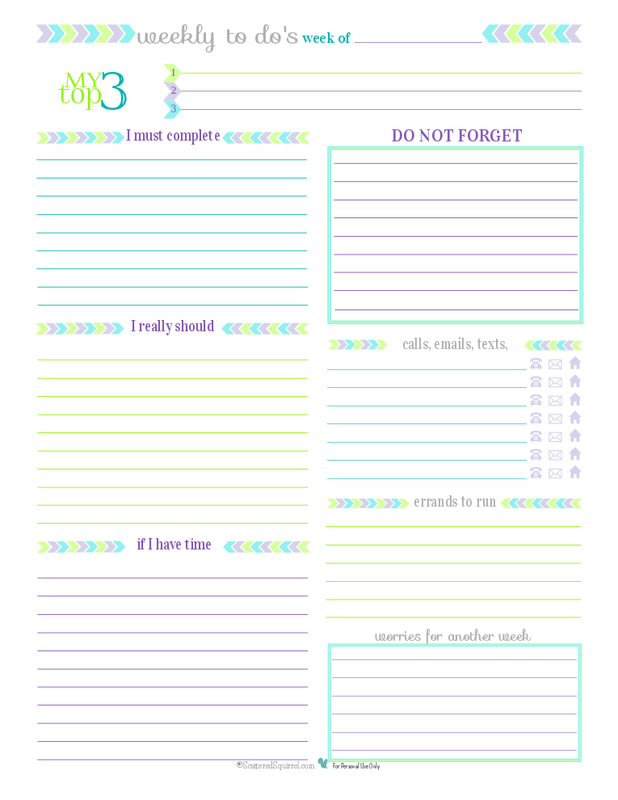 That where today’s To Do List printables come in. I have a confession to make; I use the Weekly To Do planner page almost every week. I use it to help me plan the following week. As things come up that I have to do, I jot them down on the list for when I plan out my week on Sunday. Sometimes though, I skip planning my week and just work from the to do list. I don’t do this often, as there is rarely an entire week where I don’t have to plan for anything. There are plenty of days though where I just jot down what I need to do and worry just about getting it done and less about when I’m going to do it. 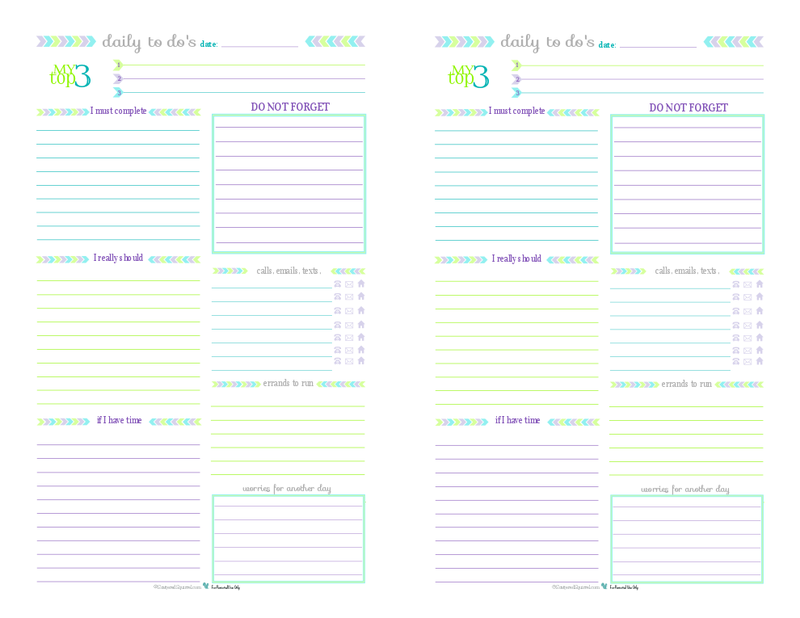 This practice got me thinking that it might be nice to have a Daily To Do List printable to match the weekly one. I did share a version of the Weekly To Do list back in April. I made a few tweaks and changes to the layout and updated the colours and fonts to match the 2015 calendars. (Are you noticing a trend?) As I was working on it I started thinking about nice it would be to have one just like it, but for a day instead of a week. I mean sure, you could use it just for a day, but it says weekly at the top, that could be confusing. So, I made a daily one to match. It is exactly the same in every way, except instead of weekly it say daily. One more thing I did because I felt these printables really needed it, was to make them each in a half-size version. So scroll on down and check them out. 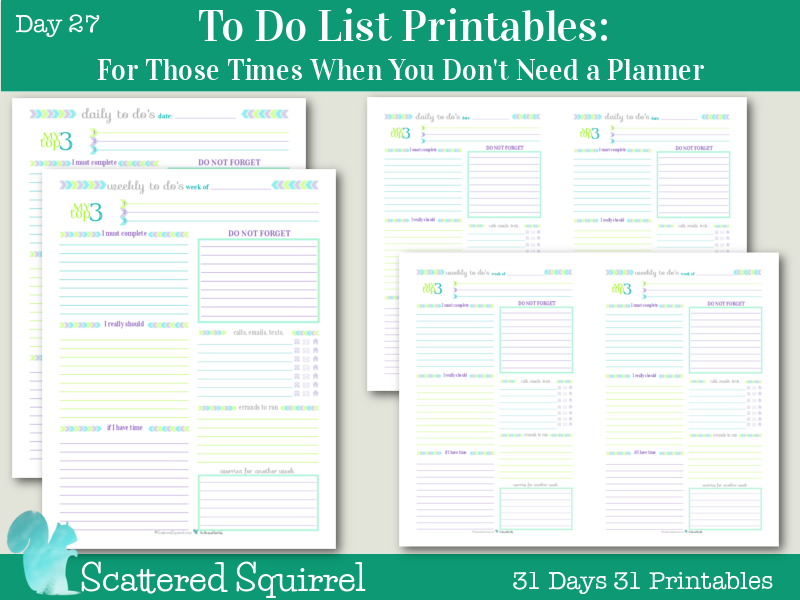 I cannot wait to print out some of each and put them to work I’m especially excited about the half-size weekly to do list printable. I think it is going to be a great addition to my personal planner. After using it for almost a year and tweaking things here and there, I think I’ve finally found the right set up for my personal planner. I can’t wait to share it with you all, but I think I think I’ll wait until I’ve finished getting it set up for next year. Are you a to do list kind of person, a planner kind of person, or a little bit both? I have tried to do my own because I have purchased about 7 different organizers and I can not get everything combined Here is what A lot of parents:with kids that have low incomes and a lot of odd thibgs inbetween try to get in order Or worry about and need organized . 1. Doctors appts 2. School events/meetings 3. Multiple times a day Money being spent spent on gas or cigerrettes diapers food Or lending someone money, and on what how much and was it cash credit , gift card etc.4. Lending money to who and how much /Money owed /receiving date’s and how much / Other money coming in dates.5 Bill due dates 6.Keeping track of child’s behaviors when and what they did. 6 Reward charts ( list a chore and once accomplished they get a star. Each Family members responsibility on on daily basis.7. Daily by time to do’s for child 7 years of age . 8 Accomplishments and goals. Also a organizer with all my emails and there passwords along with my other accts online and there passwords. Gist cards with there nunbers and amounts on them. I have tried using different notebooks and printing NY own sheets but it doesn’t work because when I’m out and about I forget the little stops I make and spent money here and there. I need something that I can take with me but also something huge for The kids to see and be able to use for there things. It sounds to me like what you’re looking for is an entire planning system. 🙂 I talk about them in my How to Create the Planner that Works for You series. If you had to pick one of those areas as being the most important place to start, what would it be? I’ll see if I can work it into an upcoming reader request feature! Hi. Just found your websites. I was getting frustrated with purchasing planners because they never met all my needs and then I saw something of yours on Pinterest. Your pages are beautiful and practical. Thank you! Thank you so much for the free printables they are beautiful and very useful!!! Thank you for this! It’s so pretty that it makes me excited to fill out my day’s to-do’s! Your printables help me start fresh and focus on my top priorities. Thank you for the time you put into them! Thank you so much for saying that. I’m thrilled to hear that you’re finding the printables useful. I hope you continue to find ones that work for you! Reading your “about me” was literally ABOUT ME! I stumbled across your AMAZING to do list printable and INSTANTLY I had a small amount of HEAVEN on EARTH!! It is EXACTLY what I have been trying to create myself! But I was struggling with fitting it all on page! I could go on and on! But I have 5 sleeping kiddos, a snoring hubby beside me in bed, and its awful hard to see with the nightlight on my laptop and the lights off! lol So I have an idea for you! Its at the TOP of my list to email it to you!! CANNOT WAIT TO EMAIL YOU!! !